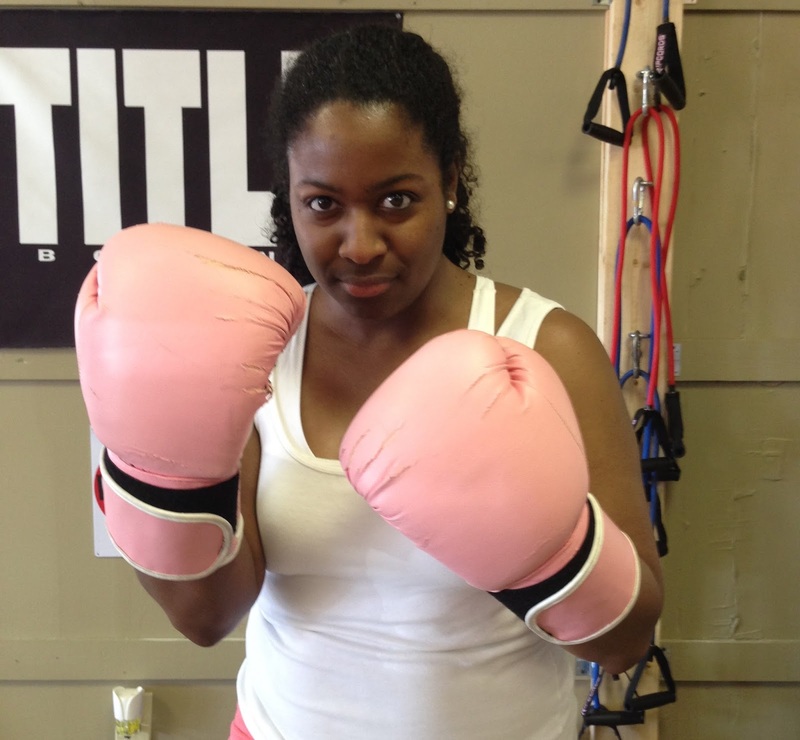 (and wearing pink boxing gloves, which, of course, I requested). I have yet another reason to love Jillian Michaels. Before today I hadn't taken a boxing class in years, so as gym owner Martin Juarez helped me with my boxer hand wraps I felt a bit of trepidation in my belly. Then our warm up began. Jumping jacks! Quick punches! High knees! My heart rate began to elevate, but as I repeated these exercises for our warm-up circuit I was able to do each move with relative ease. Though I hadn't boxed in years, for my body, this warm up was nothing new as I often do the same exercises when working out with Jillian Michaels DVDs in my living room. After the warmup we gloved up, found a partner, and did a series of workouts around the gym punching heavy bags and speed bags, working on our foot work, jabs, and cross punches in the ring, and jumping rope. And every now and then Juarez would yell, "Stop, drop and give me 10 push ups!" And I could do it all! In fact, the only time I even had to take breaks was when I was jumping rope and that was due to joint pain, not because I was out of breath. Martin Juarez (left) demonstrating some punches for us. Exercising every day and suffering Jillian Michaels screaming at me through my television have really improved my endurance. Don't get me wrong; my skin was still glistening and my clothes soaked with sweat halfway through the bootcamp. This workout was tough, but made me realize that so am I. This couldn't have happened at a better time. I had been feeling a bit discouraged regarding my goal of exercising every day this year. I haven't missed a day, but when I stepped on the scale at the doctor's office recently and saw that I hadn't lost any weight since my last visit, my heart sank. I know I said I wasn't taking on this 365 Days of Fitness challenge to shed pounds and I meant that. But I'd be lying if I said I didn't hope weight loss would be a side effect. But today's workout reminded me that weight ain't nothing but a number. My clothes fit better. I feel better. And today I would have made Jillian proud.